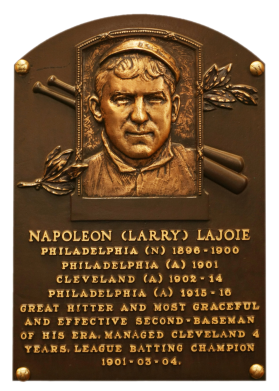 One of the best right batters in history, Lajoie was the best second baseman of his era and became the first man at his position to be elected to the Hall. A graceful fielder, he hit over .300 16 times in his career. 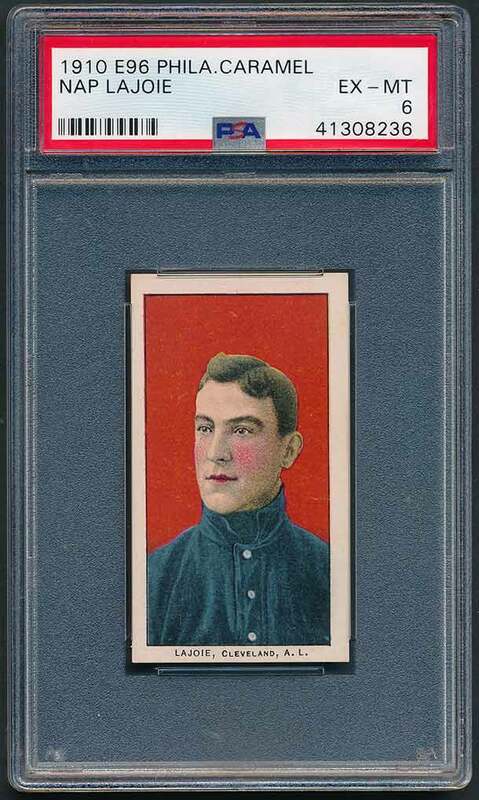 He won the Triple Crown in 1901, the American League's debut season; batting .422 with 14 homers and 125 RBI. His presence and outstanding performance gave the AL much-needed attention and respect. 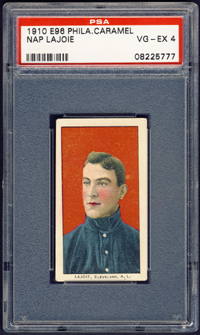 Lajoie had a career .338 average, 3,242 hits and 657 doubles. Comments: In January, 2000 I first purchased a 1940 Playball PSA 7 via eBay. A couple months later, I won an upgrade - a beautiful PSA 8 from seller Bedrock Auctions, also off eBay. In October, 2006 I decided to swap out the tribute card with an item issued during Napoleon's career and found a PSA 3 E96 on eBay which I won. I upgraded to this PSA 4 after winning a Goodwin auction in April, 2008. I've tried upgrading a couple more times but have come up short - tough card. 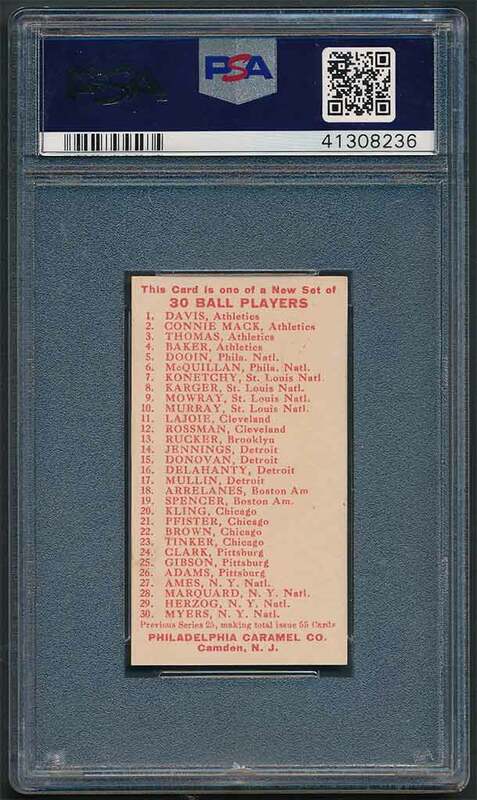 Description: This set of 30 subjects, known by the ACC designation of E96, was issued in 1910 by the Philadelphia Caramel Co. as a continuation of the E95 set of the previous year. The front design remained the same, but the two issues can be identified by the backs. 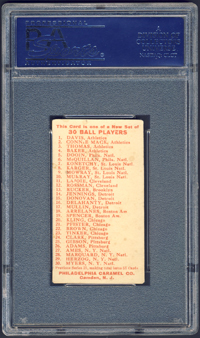 The backs of the E96 cards are printed in red and carry a checklist of 30 players. There is also a line at the bottom advising "Previous series 25, making total issue 55 cards." 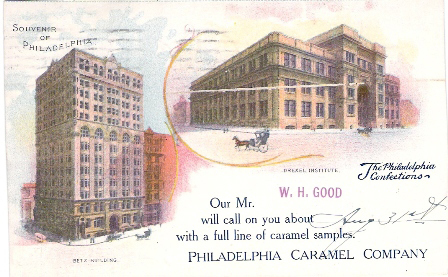 Just below that appears "Philadelphia Caramel Co./Camden, N.J." Blank-back cards printed on thinner stock are not proofs, but rather were cut off a "Base Ball Series" notebook cover.